Paul Roberts: "The End of Food"
Ashbrook: "... Are you getting unnecessarily apocalyptic on us? ..."
Roberts: "... That's a mouthful there ...."
See also the New Yorker. Joe Biden: "Defuse this crisis"
A reader points out that Senator Joe Biden's column on the food crisis and agricultural policy includes some hard reflections, ostensibly in the form of questions but packing a punch. 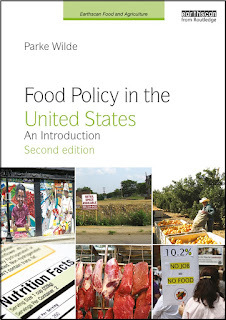 Ask the hard questions and re-examine our own food policies. 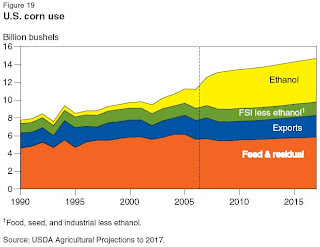 Does our current biofuels policy, which I have supported, that diverts corn from food to fuel make sense? Should we provide more flexibility to our food-aid program and allow USAID to locally purchase food abroad instead of requiring them to buy American food and shoulder all the transportation costs associated with that? Banning "downer" cattle? Allowing tests for BSE? Today, the Post headline reads, "USDA to ban 'downer' beef." That's much better on "downer" cattle, but hold the celebration for a minute. The agency argues that more widespread testing does not guarantee food safety and could result in a false positive that scares consumers. "They want to create false assurances," Justice Department attorney Eric Flesig-Greene told a three-judge panel of the U.S. Court of Appeals for the D.C. Circuit. Economists tend to believe that an economic actor's actions reveal a lot about his or her preferences and beliefs. Here's what I think USDA's actions imply about the beliefs of senior department decision-makers. They don't believe there is a large risk of a BSE epidemic, with widespread cases of the human variant of mad cow disease (the officials are surely decent enough that they would, in that case, support more mandatory testing). On the other hand, they don't believe the risk of finding a case of BSE is near zero either (the officials are clever enough that they would, in that case, allow Creekstone Beef to pursue its own quirky and pointless food safety testing strategy, and would prepare themselves for making sure true false positives were recognized as false). Instead, the officials' actions seem to me most consistent with believing there are a handful of real cases of BSE out there in the beef cattle population, and that these cases will naturally die out without infecting new cattle over the next several years. Of course, if this were true, a handful of people would be subjected to risk of the deadly disease years after eating a cow whose infection was never discovered. "... a clinic on how to use the power of the purse ..."
Under House rules, the Agriculture panel is a “minor” committee that is not required to be geographically representative. (There are six members from North Carolina and Georgia, none from New England.) The result is a panel unified behind the interests of farmers growing staple crops that collect the bulk of subsidies. This year, dairy interests did particularly well, snagging an extra $410 million to help cover rising feed costs, and imposing a 7.5 cents a pound fee on all imported dairy products to help finance domestic dairy promotion activities. The poultry industry in Virginia and Georgia beat back an attempt to deny crop insurance to Prairie Pothole farmers who plow virgin prairie lands to plant corn. In effect, the aggies held a clinic on how to use the power of the purse to silence opposition to current farm subsidies. They heaped new money on anti-hunger groups, certain conservation programs, the biofuels industry, West Coast salmon fishermen, and even a few hundred farmers in Alaska. To understand the Farm Bill debate, it helps to distinguish between trade-distorting subsidies and "decoupled" subsidies (also called direct payments). Trade-distorting subsidies, such as deficiency payments that pay farmers when prices fall below a certain level, encourage over-production, hurt the interests of farmers overseas, and complicate trade negotiations. Decoupled subsidies, which simply pay farmers a check based on their history of farming a particular crop, do not distort trade, but they provide a welfare check to many prosperous farmers and hence are difficult to explain politically. Current farm programs include both kinds of subsidy. U.S. Food Policy has noted that, compared to the bill passed by Congress, the Bush administration came out for stronger reforms to trade-distorting subsidies. Morgan gives the administration less credit than we did, in part because the administration didn't also call for stronger reductions in decoupled subsidies or direct payments. But a larger share of the blame may go to the White House. For all the Bush administration’s rhetoric about the need for more subsidy reform, it insisted on keeping or expanding the biggest subsidy of all—the $5 billion in automatic payments. That stand cost it the high ground in the end game of negotiations over the farm bill. Had the administration agreed to a significant cut in the automatic payments—say $1 billion a year—it might have come to the table with a farm bill that used those savings for all the things the nutrition, conservation and fruits and vegetables lobbies wanted. The House of Representatives this week passed the post-conference version of the Farm Bill by a veto-proof majority, after Republicans abandoned the White House position. The Senate also passed the bill on Thursday. This bill is $20 billion over budget, not paid for, and full of accounting gimmicks and time shifts in payments... This is not in the best interest of American Agriculture. This is not in the best interest of American taxpayers. Congress can do better than this.... This Farm Bill deserves to be vetoed, and the President will veto it. Deputy Agriculture Secretary Chuck Conner pointed out that, with current high commodity prices, farm incomes are higher than ever in recent years, so one could reduce trade-distorting subsidies without impoverishing farmers: "Now is as good a time as any for some of these reforms." Because the Farm Bill's political support depends in part on anti-hunger and environmental groups, who might otherwise have been in favor of stronger reform to traditional row-crop subsidies, the bill includes some new funding for food assistance programs, new money for fruit and vegetable growers, some gains for the CSP conservation program, and small amounts of additional funds for some sustainable agriculture priorities. I asked Deputy Secretary Conner whether these anti-hunger and sustainable agriculture priorities would be jeopardized if public interest groups tacitly supported a White House veto of the House-passed Farm Bill. He responded that the administration's concern is with the growth in total funding in the bill, and with the lack of reform to subsidies for rich farmers, not with specific anti-hunger or sustainable agriculture provisions. The administration would support the bill if Congress revised the row-crop subsidies by reducing trade-distorting price supports and capping payments to rich farmers, for example, while retaining the anti-hunger and environmental provisions. [T]his farm bill could have gone far beyond the miserly spending increases it provides for nutrition assistance to the poor at home and abroad, conservation, farmers markets, organic food, minority farmers and other important priorities that have long been neglected or under-funded. And there would have been money left over to give taxpayers a break. Apparently the Democratic caucus thought they were log rolling when the subsidy lobby tossed them some twigs. In a period when crop prices and farm incomes are soaring to record levels, the continuation of bloated subsidies to the largest, most prosperous farms in the country can only be seen as a breathtaking cop-out on the part of congressional leaders. From former student Kelly Horton's project in Seattle, Connect Nutrition. Connect Nutrition was founded to address the need for unique and innovative solutions to solve problems of inadequate nutrition, hunger, and food insecurity. We create connections and opportunities for Communities, Organizations, and People. Connect Nutrition supports organizations participating in active food, nutrition, and agriculture policy advocacy efforts and nutrition program planning and implementation to increase community food security, decrease hunger, increase access to healthful foods, and create sustainable food systems. We do this by assisting local, national, and international non-profit organizations, government agencies, academic institutions, socially responsible businesses, and community groups in all aspects of program design, evaluation, training and management, policy analysis, and advocacy in the areas of food security, community development, and poverty alleviation. Oftentimes, our clients face unfriendly political environments, operate with dwindling resources, experience budget pressures, and are in need of expert knowledge of food, nutrition, and agricultural policy, nutrition science, or technical expertise for program planning. These problems present a variety of challenges. Connect Nutrition helps organizations to achieve their missions by capitalizing on core strengths and lending expertise in the areas most needed. In the eloquent words of Doc Hatfield, "We are a community of shared values. . . healthy land, healthful food, healthy community. . . we're all one family." Contact us today and achieve your mission! Here's a passage from the funny column by Fred Grimm in the Miami Herald today. Corporate executives bent on an Internet smear campaign might first consider the ignominious unmasking of surfxaholic36. Surfxaholic36 was the online pseudonym a Burger King vice president reportedly pilfered from his young daughter to post all manner of scurrilous stuff about his company's perceived enemies. Unfortunately for Steven Grover, those enemies included the Student-Farmworker Alliance. Middle-age inhabitants of fancy corporate suites should refrain, always, from picking Internet fights with any organization with ''student'' in its title. Wrong turf, Burger Boy. Grover, as surfxaholic36, reportedly posted nasty comments laden with misinformation under Internet articles about the Immokalee-based SFA. For more about the dirty tricks company, Diplomatic Tactical Services, mentioned in the column, see the innovative SourceWatch wiki. Here is an excerpt of a Farm Bill analysis on Friday, following reports that Congressional negotiators had completed their work. ... At a time of record farm income, Congress chose to further increase farm subsidy rates, require the American taxpayers to subsidize the incomes of married farmers already earning up to $1.5 million per year, and expand government control over farm programs. This bill also adds a number of provisions never considered by the full Congress such as numerous trade-related provisions and expansion of the Davis-Bacon Act. Congress should reconsider increasing by $20 billion the current spending level of $596 billion over 10 years. The lack of reform in this bill puts future farm bills in jeopardy by eroding overall support for farm programs. The farm bill fails to adequately reform payment limitations and instead allows for excessively high limits on the level of allowable income for receiving farm subsidies. The Administration originally proposed to lower to $200,000 the Adjusted Gross Income (AGI) limit for receiving farm program subsidies. Congress wants to allow subsidies to continue for married couples who farm and have adjusted gross income of $1.5 million and for people with AGI of $500,000 who are not full-time farmers. The bill also restricts international emergency food aid, putting millions of people at risk and undermining our ability to save lives. This provision would alter current law by restricting the ability to redirect food aid dollars for emergency use, limiting the government's ability to respond to emergencies. But please don't make me identify the author of this analysis. You may not like it. It may cause you to ignore the good common sense. Sigh. Okay, it's the White House. Fuddruckers restaurants today shared with me for the first time a spreadsheet table with partial nutrition facts. As one might expect, the beef alone in a half pound cheeseburger, not counting the cheese, dressing, or extras, has 660 kilocalories and 110% of the recommended daily value for saturated fat. An email from Fuddruckers said the company will release nutrition facts in the future. Thank you for your interest in our Fuddruckers products. At this time, we do not have a formal nutritional guide available on our menu items; however, we are in the process of developing a nutrition guide. Since we are in the process of developing our nutritional guide, we do have limited information available. Attached you will find our available nutritional information. Please note that some restaurants may receive products from an alternate vendor and the nutritional/ingredient information may vary. Following the decision by Quiznos in November to release nutrition facts on the Quiznos corporate website, Fuddruckers was one of a small handful of remaining U.S. restaurant chains that would not share such information. 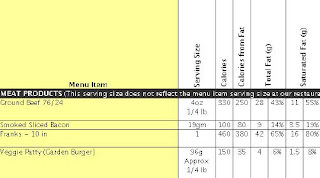 Restaurant nutrition information is a significant public policy issue, because restaurants are exempted from the federal law that requires nutrition facts information for most other food sold in the United States. The Food and Drug Administration has recommended that restaurants share such information, but has no authority to mandate disclosure. States and municipalities have been stepping in to compensate for the absence of federal leadership. From an economic perspective, information is essential for empowering consumers to defend their own interests in a free market. Under conditions of severe "information failure" in private markets, economists have no grounds for hoping that markets serve consumers well in the absence of government intervention. I first heard that Fuddruckers might be sharing more nutrition facts information from an anonymous comment at U.S. Food Policy. Thanks anonymous commenter. Recent food price increases have been dramatic, and many people are discussing the causes. One source of particular concern has been food assistance programs, such as food stamps and school lunch. Fortunately, federal food assistance programs are indexed for inflation, with updates to program benefits once per year. Program benefits may lag behind recent rapid price increases by 3-5% for a period, and then they are corrected at the next annual update. "It's been very tough for families," said Stacy Dean, director of food assistance policy for the Center for Budget and Policy Priorities, a liberal-leaning think tank. "They don't have the flexibility in their budgets so they just don't buy as much food or they buy cheap food or they skip meals altogether. Congress can and should act to help people survive the spike in prices." The fifteenth paragraph explained the impact of price increases on food stamp benefits quantitatively. The maximum food stamp benefit no longer covers the cost of the "thrifty food plan," the menu of food items the government uses to calculate its allotment. In March, it cost $567.20 to buy the items in the plan for a family of four, compared to $542.10 last June, when the inflation adjustment was set. Food stamp participants are suffering from reduced real inflation-adjusted benefits at present. The real spending power of the food stamp benefit is currently just under 5% [percentage corrected from 3.5%] below what it was at the last annual update, which can be a substantial hardship for families on a tight budget. Barring Congressional action, this shortfall will continue to grow until the next annual update. Some people consider the benefits inadequate even at the time they are updated, but that is a different issue from food price inflation. In a related story, Alexandra Lewin at Corporations and Health Watch has a nice article recently describing the hardship facing school meals programs, such as the National School Lunch Program. Both the National School Lunch Program (NSLP) and competitive foods, those foods sold a la carte outside the NSLP, are affected by rising food and gas prices. As documented by the Economic Research Service, in 2007 milk prices increased by 17%, cheese by 15%, bread by 12% and rice and pasta by 13%. Kids in poorer communities will suffer most - these already cash-strapped schools are looking for ways to cut costs, undermining many efforts districts have made to implement the mandated, but unfunded, school wellness policies. The reimbursements for federal child nutrition programs are updated once each year using the federal government's price index for restaurant and cafeteria food. The real value of the reimbursement may currently be running 3-5% below what it was at the last annual update. In the 2004 reauthorization for child nutrition programs, the federal government required local school districts to establish wellness policies. During the preceding several years, the nutrition environment in schools had been deteriorating, with the growing sales of sugary sodas and high-fat, high-sugar products in schools, but it was difficult to find any one person or committee that had actually chosen these changes. The important bad decisions had been made made piece-meal. The "mandated, but unfunded" school wellness policies mentioned by Lewin were written by the districts themselves in answer to the mandate in the reauthorization bill. Except in trivial ways, the government did not actually require particular policy changes. USDA's Food and Nutrition Service recently completed a major report on the question of whether reimbursement rates cover the costs of producing school lunches and breakfasts. 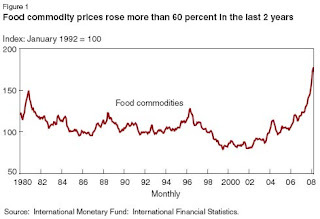 Ronald Trostle at USDA's Economic Research Service has a fascinating report this week on the causes of global food price increases. The scope of the price increase is dramatic. One of the culprits, which has rightly been receiving a lot of attention, is the growing use of crops for biofuels instead of food. Another important culprit, however, is the growth in meat consumption. Meat consumption is rising rapidly, especially in India and China. 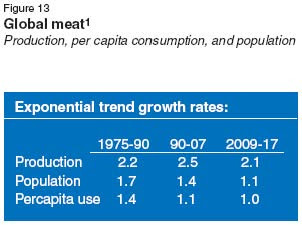 Just over half of the rate of growth in meat consumption is due to population growth. The rest of the growth is due to increases in the amount of meat each person consumes. Meat consumption is an important resource use issue, because the conversion of animal feed into meat wastes the majority of the food calories in the original crops. Ethanol subsidies have recently come under great scrutiny. But why aren't more people questioning the wisdom of the large semi-public U.S. boards for beef and pork, which use the federal government's powers of taxation to collect many hundreds of millions of dollars each year, to spend on promoting increased beef and pork consumption at home and abroad? It is fine for consumers to have the freedom to choose meat. But why is it the U.S. government's business to try to get the world to eat more meat at this particular time? That seems as strange as massive subsidies for converting corn to ethanol. Follow the checkoff tag for more coverage of these programs. Also at USDA/ERS, Ephraim Leibtag recently reported on corn price increases. Kat at Eating Liberally last month covered Marion Nestle's moderate and reasonably skeptical perspective on the contribution biotechnology will make to solving the current food problems, which provides a contrast with Agriculture Secretary Schafer's recent discussion. On meat issues more broadly, see the recent Pew report (large .pdf), also described by Elanor Starmer at Ethicurean and by Rick Weiss in the Washington Post. In her Diary of a Young Farmer, on the Edible Portland site, writer Zoe Bradbury logs her adventures trying to return to her farming roots. In the latest funny episode, she looks into the possibility of a USDA loan. The next bad news: the loan amount they could offer me, explained Jim [the regional Farm Service Agency agent], would be determined according to my projected income, which they calculate by multiplying my predicted crop yields by the state commodity prices for each crop. I did some quick math while he rattled off the numbers. On my 2.5 acres, growing about 25 different crops and selling them at the state commodity prices, it looked like I would gross about $4,900 for the whole year – which would make me eligible to borrow a few hundred dollars from FSA. Maybe enough to buy a stack of Megabucks tickets and hope for better luck from the lottery than the USDA. He told me that if I could prove that I’d received those higher prices for my crops for the past three consecutive years, then they could project my income based on those numbers instead. Of course, there is no way to write the rules for USDA loans to give Jim more flexibility, while at the same time maintaining program integrity. Like a character in a Greek tragedy, poor Jim is doomed by powers beyond his control to be the villain of this story.